For the past two weeks, I’ve shared stories from Omaha’s Temple Israel Cemetery. Most graves there are marked, even if it’s a small stone, because their loved ones could afford to purchase one. The story is quite different at Omaha’s Potter’s Field, located at 5000 Young Street near the intersection of Mormon Bridge Road. 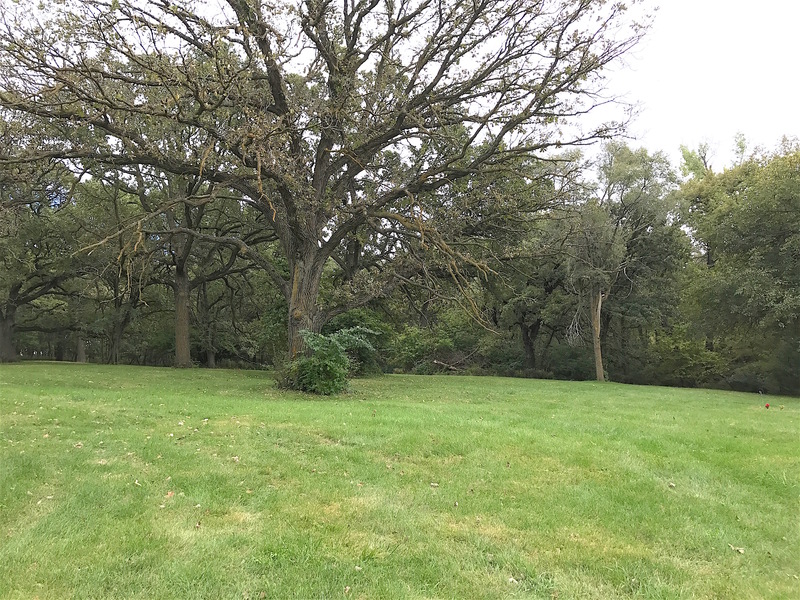 It’s five and a half acres are surrounded on three sides by Forest Lawn Memorial Park, where some of Omaha’s wealthiest residents are buried. The contrast between the two is what drew me there. Near the end of my September 2017 trip, we went over to see it. There is no parking lot but you can easily pull off the side of the road. 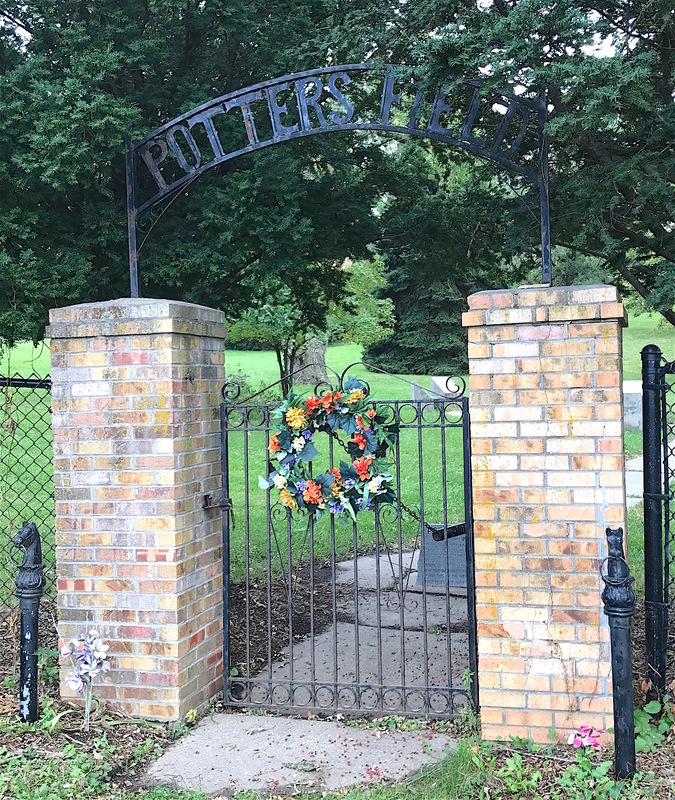 The gate and sign to Omaha’s Potter’s Field came long after the last burial in the 1950s. The first mention of a potter’s field is thought to have come from the Bible in Matthew 27. The chief priests received 30 silver pieces from a repentant Judas, who was paid that amount by the priests to betray Jesus. In anguish over what he had done, he returned the money to them then killed himself. Stating they could not keep “blood money” (even though they were the very ones who paid him), the priests used the money to buy the potter’s field as a place to bury foreigners. In other words, the “undesirables” who died in their town. It was called “potter’s field” then because the land wasn’t good enough to grow crops and was only worth using to dig up clay for pottery. In later years, such places were often referred to as a county-owned graveyard or the “poor farm” cemetery. Atlanta’s Oakland Cemetery has a potter’s field. The thing you’ll notice right off the bat is that there are very few markers at Omaha’s Potter’s Field and that’s true for most of them. The people buried there had family would could not easily afford a funeral, much less a gravestone. Or the deceased had no family or friends to even ask. Circumstances also did not encourage those connected to the deceased to do so. 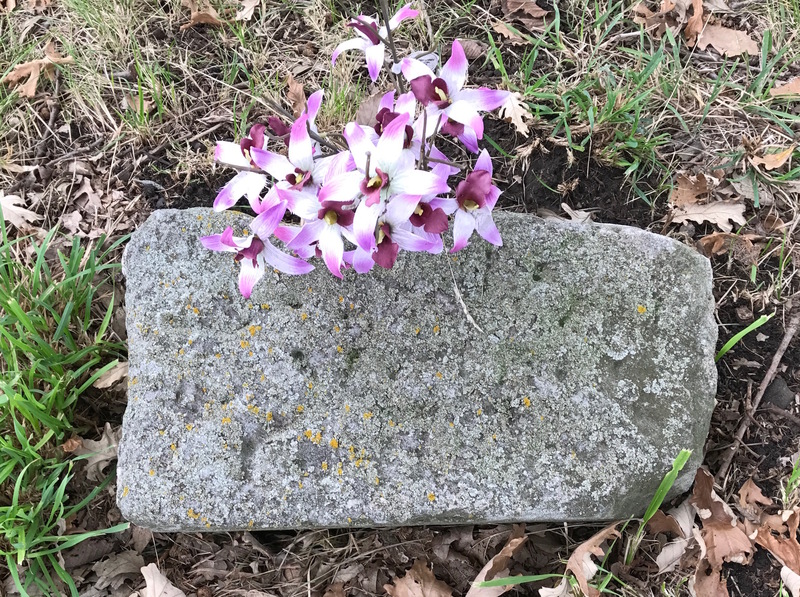 According to a 1988 newspaper article, Douglas County discouraged families from putting up grave markers because, as they put it, “If you can pay for the stone, you can pay for the funeral.” In some cases, families were asked for reimbursement of funeral costs if they tried to improve the plot. In recent years, some surviving family members have purchased and placed gravestones for their loved ones. Nearly 4,000 people are buried at Omaha’s Potter’s Field. But only a handful have markers. The stone pictured above is the first thing you see after you enter the cemetery gate. It briefly explains that Potter’s Field was used from 1887-1957. Nearly 4,000 people are buried there. During the 1950s, society began to frown upon the idea of poor farms and potter’s fields. Douglas County started paying for indigent and unknown persons to be buried in cemeteries throughout town. They were still kept in separate sections, however, supposedly to avoid offending those who’d paid to be buried there. Other cities across the country follow a similar practice. This plaque lists some details concerning those buried at Omaha’s Potter’s Field. 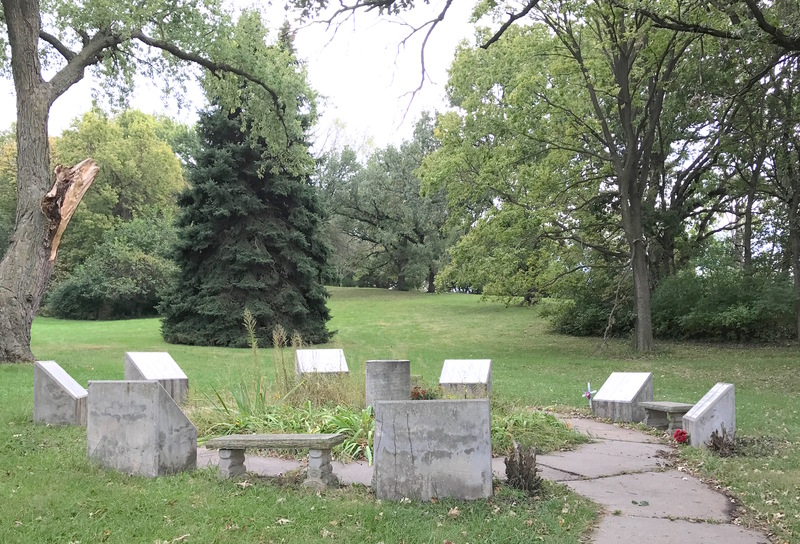 I learned that nearly half the burials at Omaha’s Potter’s Field were for infants and toddlers under the age of two. Almost all of them were unknown and abandoned. Many entries on the interment list say “unknown baby.” Brutal information such as “found in garbage,” “found on riverbank,” “murdered,” or “strangled,” jump out painfully. 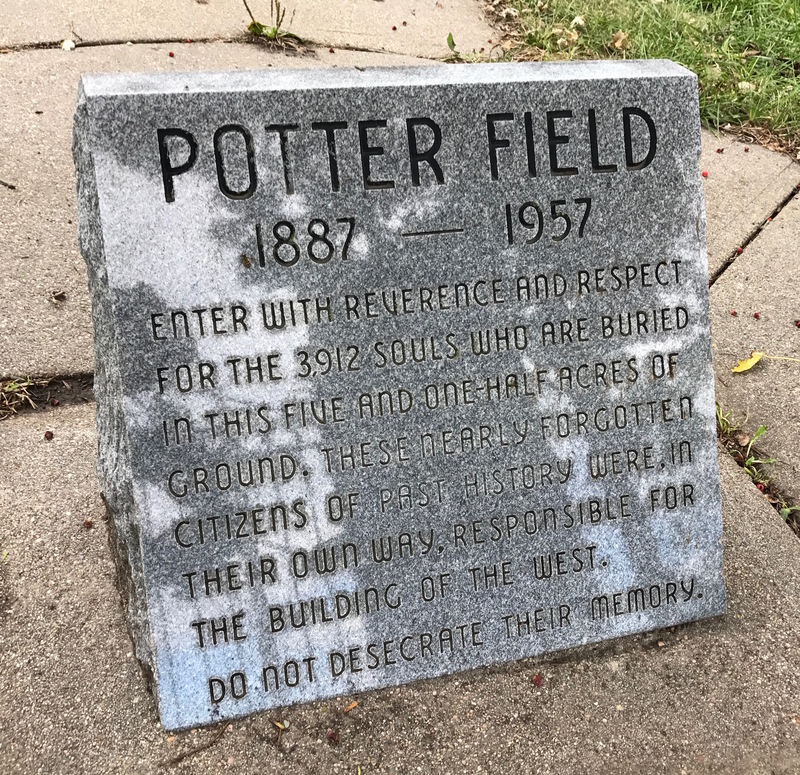 For the adults buried at Potter’s Field, they were often the destitute, the homeless, abused women and children, the mentally ill, the disabled or sometimes those who drifted from town to town without roots who had met an unfortunate end. You can find the names listed on stones that encircle a sundial. Many of the people buried at Potter’s Field are unnamed infants. After Omaha’s Potter’s Field closed, despite being owned by Douglas County, the grounds fell into disrepair. During summers, weeds grew waist high. Teens hung out there to drink and party, leading to the desecration of what few gravestones were there. The cemetery was often littered with trash after such gatherings. A view of Potter’s Field looking back about midway up the hill. In the 1970s, local Boy Scout troops cleared the grounds to make the cemetery look better. They worked hard for a while to keep it up but over time the cemetery fell into disrepair yet again. 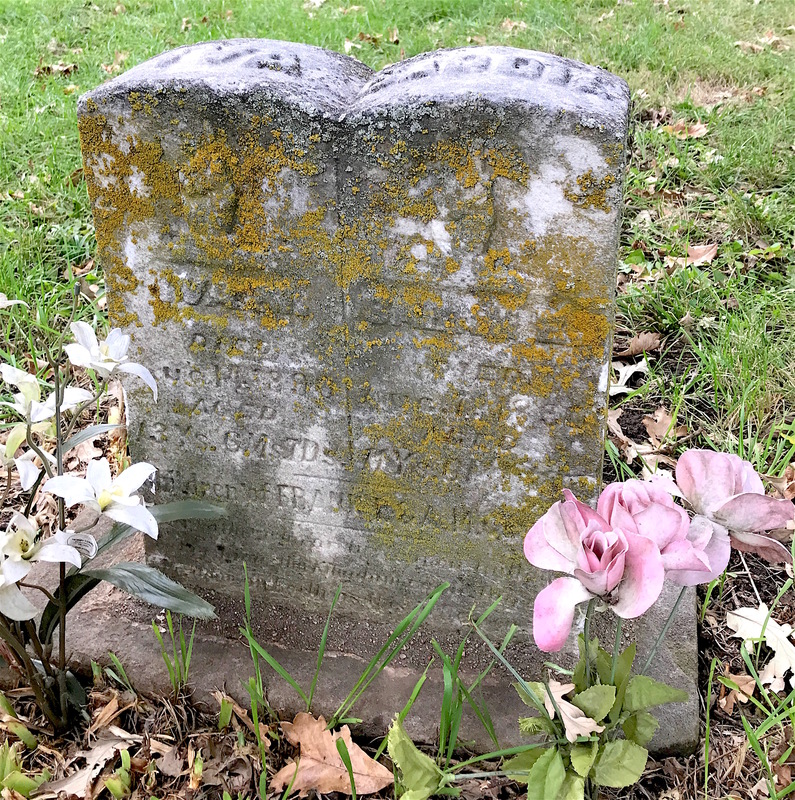 This is not uncommon with such cemetery revitalization projects when many in a volunteer group (not just the Scouts) who took care of a abandoned cemetery moved, grew too old to do it, or simply lost interest. In 1985, former Douglas County Sheriff Richard Collins headed a volunteer effort to again restore the old cemetery. 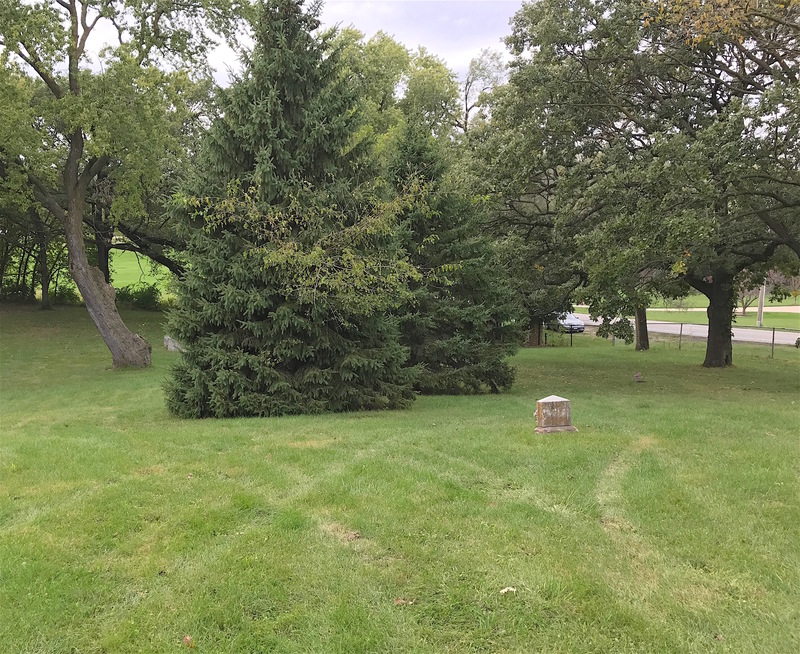 With help from others, Collins raised the $22,000 needed to properly restore the grounds. In September 1986, Potter’s Field was re-consecrated and the memorial erected. This included the tablets of the names they could find from government and neighboring Forest Lawn Cemetery records. The name on this stone is no longer readable. Some historians have tried to find ancestors of the interred with little success. Many have no traceable connection to families of present-day Omaha.Unlike today, with the Internet collecting information about everyone, it was quite easy to make little of a footprint back then. If you didn’t have any true home and were going where circumstances placed you, encountering a census worker would be unusual. This stone for the Clark sisters does leave a few clues. Iva and Sadie Clark were 13 and 11, respectively, when they died in 1890 within a few days of each other. One of the articles I found said a world-wide influenza epidemic (not the Spanish Flu) that raged from 1889-1891 may have been the cause. Their parents were Frank and A.M. Clark. That’s all that’s known about them. Iva and Sadie Clark probably died during a flu epidemic that caused many deaths between 1889-1891. The Chapman children likely suffered a similar fate. Nothing is known about their parents, J.L. and E. Chapman. 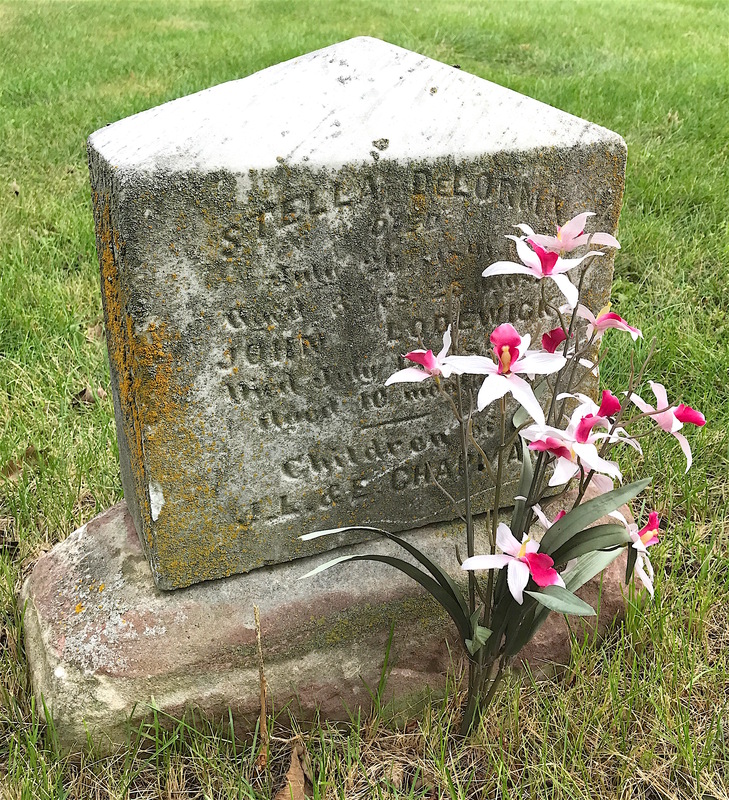 Stella and John, ages three years and ten months, died within days of each other in 1891. They’re among the few whose parents were able to provide them with a marker. Stella and John Chapman also died within a few days of each other. 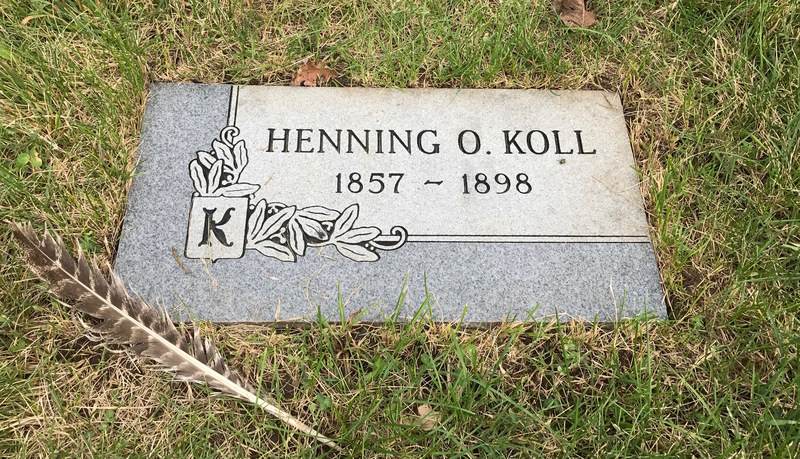 The marker for Henning O. Koll (1857-1898) looks like it may have come in recent years. I found him in the 1895 Omaha City Directory listed as a fireman. Henning Koll is listed as a fireman in the 1895 Omaha City Directory. Notice the large feather beside his marker. 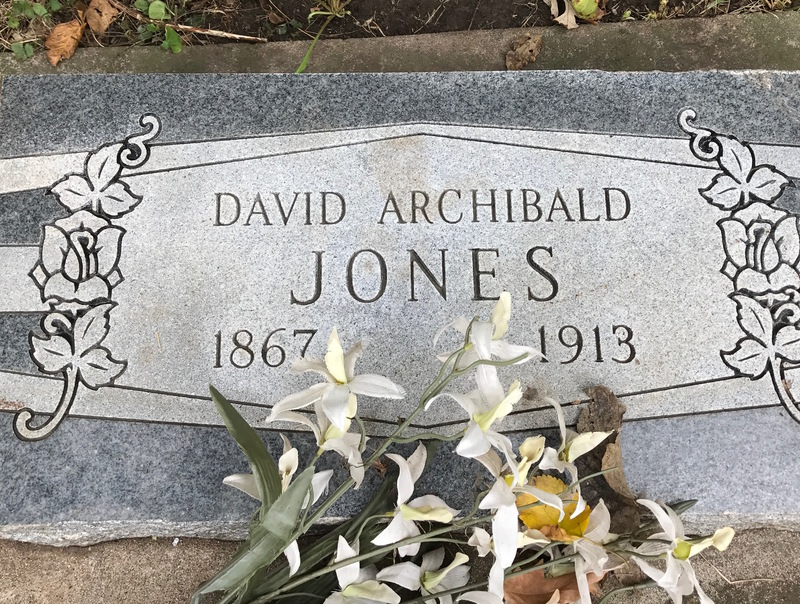 The newer look of David A. Jones’ marker also leads me to believe it was more recently placed. With a surname like Jones, it’s hard to find out very much about him. There is one person buried at Omaha’s Potter’s Field who didn’t have a marker until recently. But he was at the center of an event in Omaha history that changed it forever. That man was William “Will” Brown. 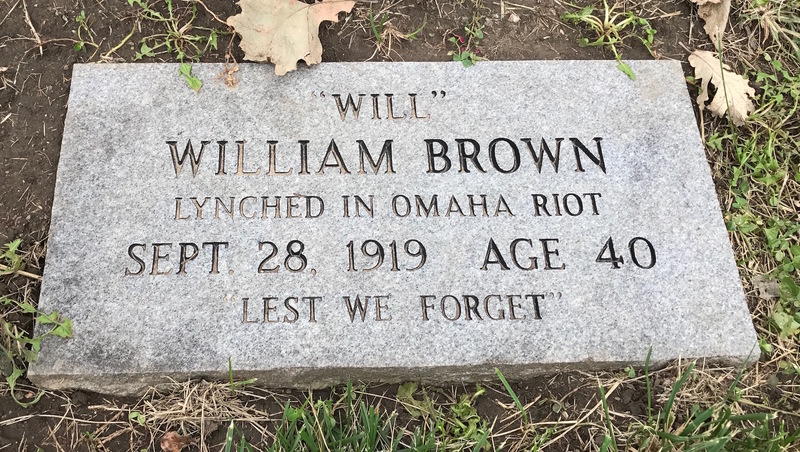 The story of how 40-year-old African-American Will Brown was lynched on Sept. 28, 1919 and the riot that surrounded it has many layers. There’s a long back story that led up to what created the atmosphere in which it culminated. This article does a great job at explaining the events of that day far better than I can in this post. 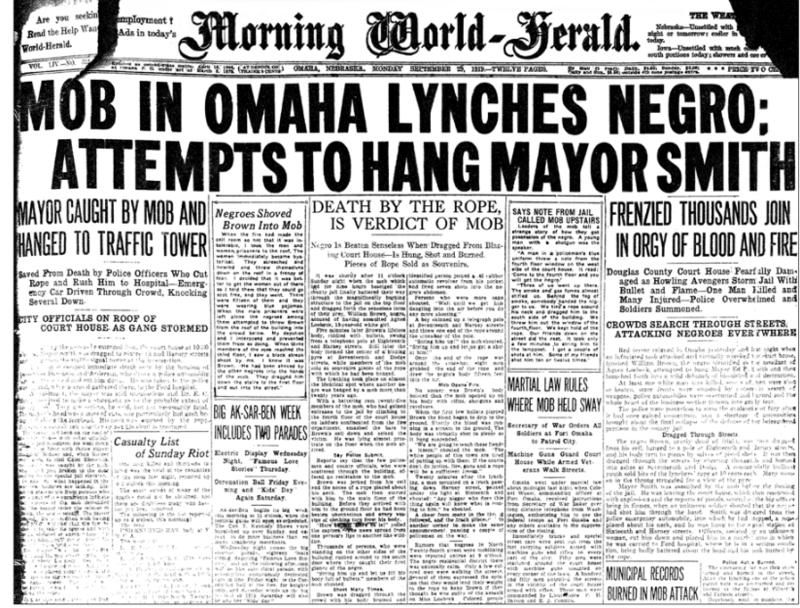 Omaha Morning World-Journal headline from the day after Will Brown’s lynching in Omaha. You probably know I live in Georgia, a state with a dark history of lynchings. When I was growing up, this history was rarely mentioned in schools. According to the Tuskegee Institute, more than 73 percent of lynchings in the post-Civil War period occurred in Southern states. That’s a damning statistic. But that leaves 27 percent that occurred in other parts of the U.S. The sad fact is racism exists everywhere. Will Brown’s grave had no marker until Californian Chris Hebert found out about it and paid for one to be made. California resident Chris Hebert learned about the 1919 Omaha Race Riot and Brown’s lynching from a TV program he saw about Henry Fonda. The actor was 14 at the time and witnessed the riot from his father’s office in Omaha. As a result, Hebert paid to have a marker made to honor Will Brown. I am thankful to Chris Hebert for doing this to keep Will Brown’s memory alive. In turn, none of those buried at Omaha’s Potter’s Field should be forgotten. While we don’t know much about their histories, their lives mattered. Be it a newborn baby or an impoverished drifter making his way west, they were here among us. If just for a short time. I have reason to believe my step grandfather’s (1891-1984) little sister is buried there. Their father traveled with Buffalo Bill’s Wild West Show as a whip man. I believe his name was Sam Jeys. I only know that at age 10, my step-grandfather ran away & was found sleeping in ditches, and his little sister had died. I’ve been to Potter’s Field, but no marker or anything found. If you want to know the exact location of the grave, I would contact Forest Lawn Cemetery to see if they might know. I think they were tasked with taking care of Potter’s Field in the early days. I will email you this information as well. Hope this helps! Thank you for that lovely tribute to our local Potters Field, Traci. 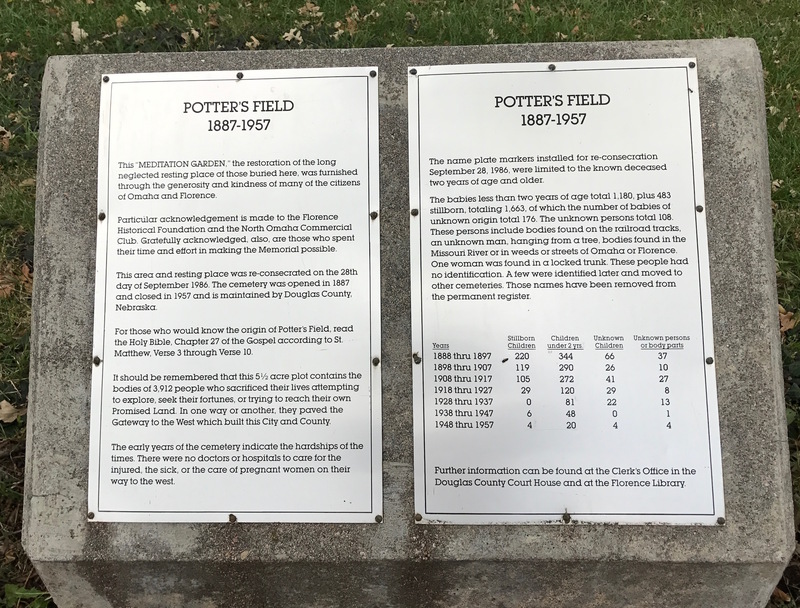 Roger, I truly enjoyed visiting Omaha’s Potter’s Field and had the opportunity to write about it. Thank you for your kind words! This is among the best of the series, Traci! So much to think about where the “unknown” and unfortunate people of human life can end up: a “Potter’s Field”. Thanks for refreshing the background of the Potter’s Field term. I known about the famous Atlant’s Oakwood’s Cemetery Potter Field. I wonder if Atlanta’s Westview has such an area? My mom’s 20th anniversary of her death is April 1. I might check into that at their office to see. Hi, Tom! Yes, Westview had a similar area called God’s Acre that I believe is in a wooded area behind where the office is located. They let it go to seed years ago and now it is pretty much inaccessible. I am friends with the guy who recently wrote a book about Westivew. I was at an event at the Abbey a few years back when he asked one of the Bowens about it. From what he said, it’s in such bad shape that you’d probably break a leg trying to look for any markers. I’ve had a few people contact me about this over the years trying to find relatives. There was also an area called Rest Haven for African-Americans but I’m not sure where on the property that is located.